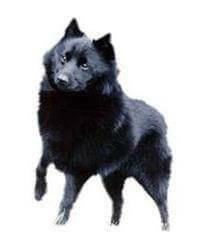 The Schipperke is also known as the ‘Belgian Barge Dog’, ‘Little Captain’ and ‘Little Black Devil’. Originating in Belgium, Schipperkes were first noted in the writings of the monk Wenceslas in the 15th Century. In the 1800s Belgian gentlemen would craft special brass collars for their Schipperkes and proudly walk their dogs through town. Schipperkes also served as watchdogs and ratters on barges, keeping an eye on the cargo and befriending the horses that towed the barge. Schipperkes can live up to 14 years of age. A Schipperke should be active, intensely lively and alert, and its temperament should be amenable, intelligent and faithful. Schipperkes are strongly loyal to their family and friendly to children, but are distrustful of strangers. Schipperkes can co-exist with other small dogs, cats and good-natured large dogs. Training from an early age may be required to achieve this. Some larger dogs have been known to harm Schipperkes, so an assessment of the nature of the large dog is required. In the absence of people, Schipperkes enjoy the company of other Schipperkes. Pet rabbits, guinea pigs, and mice should be well fenced so that Schipperkes cannot reach them. All dogs need food at least daily, fresh water at all times, shelter, veterinary care, training and lots of love. Schipperkes are low-maintenance dogs. They don’t require bathing, but may be brushed or combed occasionally. The coat is fairly short. It drops once a year (twice for intact females). Nails need regular clipping. Some Schipperkes have skin allergies due to creepers such as Wandering Jew and Ivy, fleas, red meat or preservatives. The Schipperke is a watchdog and will raise the alarm when the doorbell rings. Anyone who is captured by the nature and appearance of the Schipperke and who can meet its needs as described above would make a good owner. Families with primary school age children, elderly people and people with small yards may be especially attracted to the Schipperke.